When Should I Start Cutting My Westie’s Hair? Have you gotten your Westie groomed recently? Grooming can be a pain with any breed, but with Westies, it is extremely important to develop good grooming habits from the start. Learning about the grooming process for Westies and sticking to these practices will ensure that your Westie will stay looking beautiful. When Do I Start Grooming My Westie? You should begin grooming your Westie even as a puppy. If you are adopting, the day you bring them home is a good day to start! Westies need to get used to grooming and grooming routines from the very start, and doing this will make each experience easier and more effective. It is best to groom your Westie once weekly, clipping out-of-place hairs and checking their ears. They should be brushed out daily for two-to-three minutes. With puppies, you should begin with two-to-three minute grooming sessions. With lots of praise, you will be amazed at how quickly they adapt to the grooming process and begin enjoying their groom-time with you! Praise your Westie if he or she is behaving well, but be firm and corrective if they are not. It is important to remain patient and calm, because they can sense any stress that you are feeling and will probably emulate this stress during the grooming process. There is no need for heavy-handling a Westie, and you should never yell or scare your pup while he or she is on the grooming table. Make sure your Westie is combed out and tangle-free before taking he or she to any grooming appointments. It is a good idea to get them used to a blow-dryer, clippers, and other grooming products before sending them to a professional groomer for the first time. 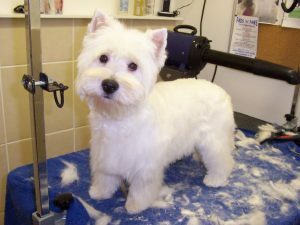 Bathing your Westie about a week prior to their grooming appointment can be helpful, because this ensures that the groomer only has to cut or shave them instead of worrying about bathing them. Also be sure that your Westie is used to standing and behaving well on a grooming table to minimize any risk for accidents. Stripping is usually performed on show dogs and makes the coat more coarse and hard. Clipping tends to make many dog’s coats softer and wavier. It is also a quicker and easier process for both groomers and owners. The decision between stripping and clipping depends solely on the owner’s opinion. If you are taking your dog to a professional groomer, make sure they know how to properly groom a Westie, and ask them what experience they have with both methods. Also be sure to ask them to sterilize their tools beforehand. Find a comb or brush that works well for YOUR dog. Invest in a good detangling spray. Try not to go longer than four to six weeks between grooms when a Westie is fully grown. Find a groomer that you trust wholeheartedly. Even if you have to interview lots of different groomers, it will be worth it to find one that both you and your dog trust! Try not to switch groomers. Your dog will have a hard time adjusting if you use a different groomer each time. Try to learn how to groom your Westie yourself! It can be a fun and rewarding experience for both you and your dog! Stick around the first time your dog is being groomed–this may make he or she more comfortable and more likely to behave for the professional groomer. Treats, treats, TREATS! Treats are an excellent way to reward your Westie for behaving well during grooming time, and will ensure that the good behavior continues! Grooming your Westie can be a stressful experience, but knowing when and how to groom them takes the stress out of it! You can always learn how to groom yourself, but taking them to a professional groomer also does the trick. Be sure to research different styles and find one that you think suits your dog best. Try getting your Westie used to the grooming process as early as possible, even if they are just a puppy! This will help tremendously in the long run. Reward your Westie with treats for their good behavior during groom time and they will learn to love it (and will stay looking beautiful! ).